As an investor, would you buy shares in a company that is at the center of a political and legal firestorm? What if this company has a CEO who has lost the faith of his board and an ex-CFO who is being accused of shady financial practices? And would you pull the buy trigger if the company has delayed its scheduled annual filing by more than two months, and by doing so is running the risk of violating debt covenants and being pushed into default? And to top it all off, would you be a little worried if the largest investor in the stock, a well known activist with his reputation and wealth on the line, is now calling the shots? No way, you say! At the right price, I would, and that is the reason that I decided to revisit my Valeant valuation last week, six months after I valued it for the first time, in the aftermath of a crisis born of hubris and happenstance. In structuring this post, I will draw on an old-time consulting matrix, where companies were classified into stars, cash cows, dogs and question marks, to illustrate the transience of these classifications, since Valeant has cycled through the entire matrix in a year. During a period when other pharmaceutical companies were struggling with revenue growth and profit margins, Valeant outstripped them on both counts, growing revenues at almost 43% a year while posting higher operating profit margins than the rest of the sector. At least on the surface, the company seemed to be delivering the best of all combinations: high growth with high profitability. 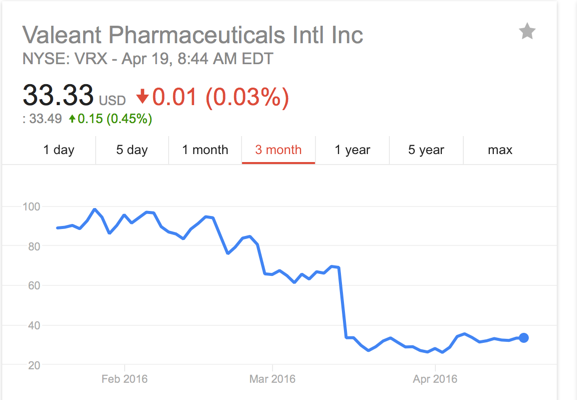 So, how did Valeant pull of this feat? 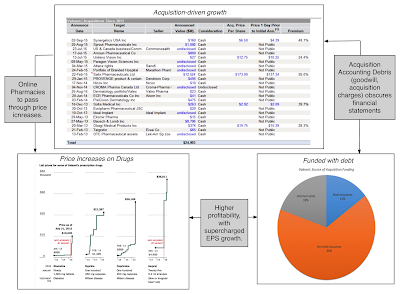 In an earlier post on the company, in November 2015, I argued that the Valeant business model was a stool with three legs: growth from acquisitions, with the acquisitions funded primarily with debt, followed by a strategy of increasing prices on "under priced" drugs. The unique combination of growth and profitability made the company a target for value investors, making it a favored stop for investors as diverse as Bill Ackman, the activist investor, and the Sequoia Fund, a storied mutual fund, and a dominant part of their portfolios. In their defense, not only were these investors transparent about their big bets on Valeant, but at least until September 2015, their concentration was viewed as a strength rather than a weakness. In fact, when I posted on why diversification is a necessary component of even a value investing strategy, it was these two investors that were held up as a counters to my argument. 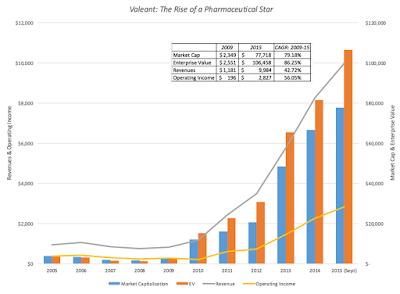 Valeant was not only delivering the value trifecta, high revenue growth in conjunction with high operating profit margins and generous excess returns, but was doing so on steroids (taking the form of low taxes and high debt). One note of caution even then, though, was that the business model was built on an architecture of acquisitions, with acquisition accounting playing a large role in pushing up operating profitability and lowering taxes. If you were unfazed by the acquisition accounting effect and assumed that the company could continue to deliver this combination going forward, the value per share that you would have obtained for the company would have been more than $200/share. 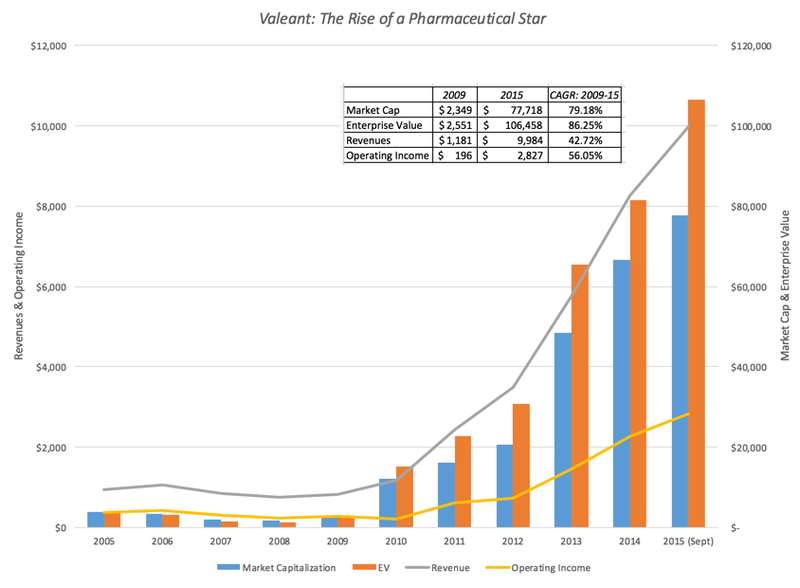 In estimating the value, I did lower the compounded revenue growth for Valeant to 12% for the next ten years, but that translates into revenues more than tripling over the decade. While many trace Valeant's fall to September and October of 2015, when short sellers launched an assault on its links to Philidor, an online pharmacy, the business model was already under pressure in the months prior, a victim of its own financial success. The model was designed, in my view, to operate under the radar, since key parts of it (the drug pricing and acquisition accounting) would wither under exposure. While much of what Valeant did in 2010 and 2011, when the company was not a household name, went unnoticed, its actions in 2015, when it was a higher profile company, drew attention from unwelcome sources. The company's acquisition of Salix increased the scrutiny, both because of it's size and partly because the Salix drugs that Valeant acquired (and repriced) affected more people (and drew more complaints). The Philidor revelations pushed these concerns into hyperdrive and the stock lost almost 55% of its value in September and October, dropping from $180/share to $80/share. In my November post, I rehashed much of this story and argued that even if Valeant were able to survive legal and regulatory scrutiny, the company would never be able to return to its old business model. In effect, even in the absence of more bad news, Valeant would have to be run like other pharmaceutical companies, reliant on R&D, rather than acquisitions, for (more anemic) growth. Removing the debt-funded acquisitions and the drug repricing from the business model yielded a company with lower revenue growth (3% a year, rather than 12%), lower margins (a pre-tax operating margin of 43.66%, instead of 49.82%) and higher taxes (with an effective tax rate of 20% replacing 16.51%). Note that these numbers were reflective of more conventional drug companies and reflect a profitable, albeit slow-growth business. With these numbers, though, the value per share that I obtained for Valeant was about $77, down substantially from its star status, but the market price, at $82, was higher. From Cash Cow to Dog? Information blackout: In November 2015, when I valued Valeant, I used the most recent financial filings of the company, from October 2015, to update my numbers. Almost six months later, there have been no financial filings since, and the 10K that was expected to be filing in February 2016 was delayed, ostensibly because the company was still gathering information, and that delay has extended into April. Managerial Double talk: In the intervening months, Valeant’s managers have been in the news, almost as often giving testimony to Congress, as holding press conferences. Arguing, as they did, that they grew through R&D like any other pharmaceutical company and that their revenue increases came mostly from volume growth (rather than price increases) was so much at odds with the facts that they became less credible with each iteration. Michael Pearson’s hospitalization for an undisclosed illness, just before Christmas, was something that was out of the company’s control but its handling added to the air of opacity around the company. Legal Jeopardy: The Philidor entanglement, the original source of the crisis, did not go away. In fact, the company, after claiming that separation from Philidor would be low-cost and easy backtracked in January and February with disclosures that suggested deeper links, with the potential for legal problems down the road. Debt load: Debt is a double edged sword, increasing earnings per share and providing tax benefits in good times but potentially making bad times worse. That argument got backing from what happened at Valeant, a company that accumulated more than $30 billion in debt during its acquisition binges, with about half of that debt being added on during 2015. That debt came with the added covenant that if financial disclosures were not filed by March 30, 2015, the firm could technically be in default, a possibility that spooked markets. This price collapse, following last year’s swoon, has reduced the market capitalization of the company to $11 billion, almost 85% lower than its value a year prior. In late March 2016, the company announced that Michael Pearson would be stepping down as CEO, the clearest sign yet that there will no return to the old business model, and Bill Ackman increased his involvement of the company in a bid to preserve what was left of his investment in the company and more importantly, his reputation as a savvy activist investor. The Dark Side of Debt: The debt at Valeant has become more burden than a help, as it has not only triggered worries about covenants being violated but has opened up the possibility that that the company will have trouble making its payments. In fact, Moody's lowered the bond rating for Valeant to B1, well below investment grade, in March 2016, causing an increase in the cost of capital used in the valuation from 7.52% (in my November 2016 valuation) to 8.29%. The secondary impact is that there is a chance now that Valeant's going concern status may be jeopardized by its debt commitments; I assume a 5% chance of this occurrence in conjunction with the assumption that a forced liquidation of its assets will come at a discount of 25% on fair value. The Bad News in Delay: Delayed news is almost never good news and there are two key operating numbers where the delayed report can contain bad news. The first is that the company may restate revenues, reflecting its separation from Philidor and perhaps for other undisclosed reasons. The second is that the company may reveal that some or all its acquisition-related expensing from prior years may have been overdone, resulting in some or a big chunk of these expenses being moved back into the operating expense column. In my valuation, I will assume (and cheerfully admit that this is based on no news) that the revenue reduction will be small (about 2%) and that half of all acquisition expenses will be shifted to operating expenses, reducing the pre-tax operating margin to 40.39% (from the 43.66% that I used in November 2015). 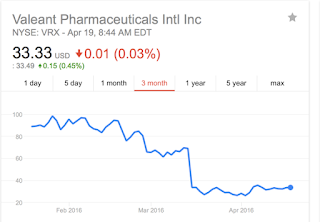 Is there a chance that the earnings report could contain news that make Valeant a bad investment at $32? Of course, and you will have to make your own judgment on that possibility, but based upon my priors (uninformed though they might be), it looked like a good investment at $32, late last week, and I own it now. I am sure that Valeant will be used to draw many lessons and I will extract my share in future posts about acquisition accounting, activist investing and corporate finance. The first is that acquisition accounting is rife with inconsistencies and plays into investor biases and preconceptions about companies. The second is that cookbook corporate finance, with its dependence on metrics and magic bullets, can have disastrous consequences when it overwhelms the narrative. The third is that activist investing, notwithstanding its successes, has two weak links: concentrated portfolios and investors who can become too wedded to their investment thesis. I will continue to draw on Valeant as an illustrative example of how quickly views on a company and its business model can change in markets and why absolutism in investing (where you know with certainty that a business model is great or awful, that a stock is cheap or expensive) is an invitation for a market takedown.